Dean Robert Adler (U. Utah) headlines the latest issue of the Washington Law Review (Vol. 88, No. 3). In his article, The Decline and (Possible) Renewal of Aspiration in the Clean Water Act, Dean Adler explores why the U.S. has failed to accomplish the goals of the Clean Water Act and suggests how a few changes can help the country make progress towards those goals. Washington practitioners will welcome the thorough treatment of Washington's new trust legislation by Prof. Karen E. Boxx and Katie S. Groblewski. Other authors in this issue include Brianne J. Gorod, Appellate Counsel, Constitutional Accountability Center; Simona Grossi, Associate Professor of Law at Loyola Law School, Los Angeles; and David A. Simon, Fellow, Project on Law and Mind Sciences at Harvard Law School. 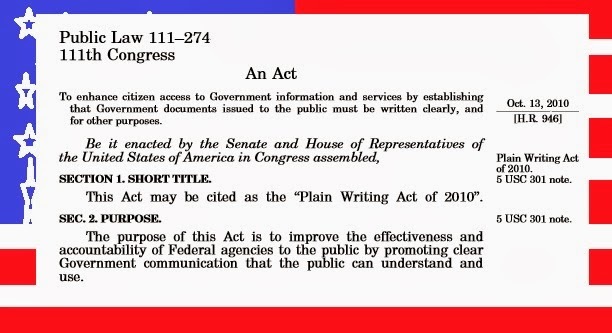 Did you know that there's a law that requires the federal government to write new publications, forms, and publicly distributed documents in a “clear, concise, well-organized” manner? Perhaps you haven't noticed a dramatic change. That might be because agency response to the law has been, um, a little uneven. That's according to the 2013 Plain Language Report Card from the Center for Plain Language. The Center gives the Social Security Administration an "A" for compliance with the act and an "A" for plain language (nicely done! ), but gives both HUD and Treasury "F" for compliance and "D" for plain language (needs improvement!). 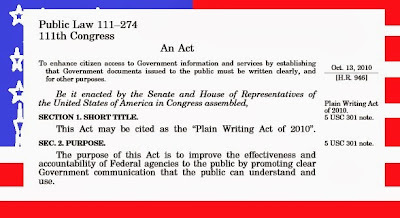 The Center for Plain Language is about plain language everywhere, not just in the federal government. Its annual ClearMark Awards include the public, non-profit, and private sectors. The Center's Resources page includes a checklist for setting up a plain language program from the first coordinator of Washington State’s Plain Talk program. And for what not to do, look at the examples from the Center for Plain Language's WonderMark Awards. 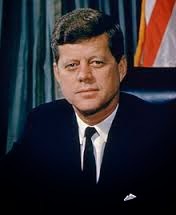 It is impossible to miss the news coverage on the upcoming 50th anniversary of the assassination of President John F. Kennedy. I was in grade school. The principal's voice came over the loud-speaker; we could barely understand what he was saying because he was sobbing so much. The teachers began crying and even those of us too young to appreciate the tragedy were affected by the sight of every adult's emotional reaction. The 900-page Warren Commission Report (1964) investigating the assassination is now available online through the Government Printing Office's FDsys site. Also available is a collection of audio recordings made on the flight of Air Force One from Dallas to Andrews Air Force Base. The audio files are in MP3 format. 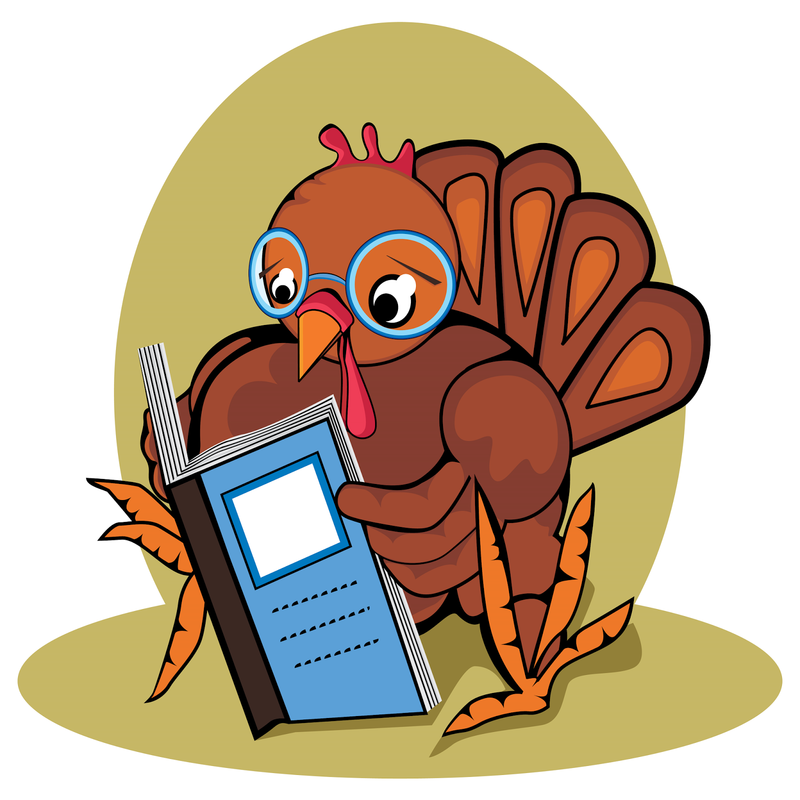 Have you ever wondered what your professors are reading? Maybe not. But the fine folks at the Wolf Law Library at the Marshall-Wythe School of Law at the College of William & Mary in Williamsburg, Virginia (full disclosure: my alma mater), have been wondering just that about one professor in particular. Unfortunately, they can't simply ask him, as he has been dead for over 200 years. I am speaking of George Wythe, America's very first law professor. George Wythe. Image courtesy of William & Mary Law School. A quick primer: Wythe was a prominent politician and lawyer in Williamsburg, back when it was the capital of Virginia and not just a fifth-grade field-trip destination (and I say that with great affection, having lived there for three years). He signed the Declaration of Independence and represented Virginia at the Constitutional Convention. 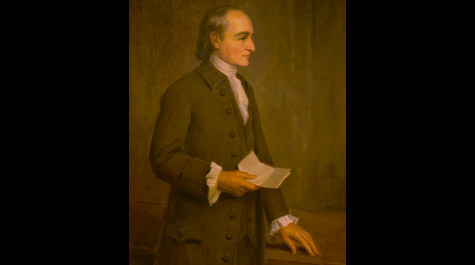 He mentored a number of aspiring lawyers including Thomas Jefferson, John Marshall, and James Monroe, and he officially became the first law professor in the U.S. in 1779, when Jefferson, as Governor of Virginia, appointed him to the newly created Chair of Law and Police at the College of William & Mary. The librarians at the Wolf Law Library have been doing what they call "forensic bibliography" to try to recreate Wythe's law library. This process has not been easy, as no one definitive record of Wythe's holdings exists. Upon his death, Wythe bequeathed his entire library to Thomas Jefferson, and while Jefferson's cousin, George, catalogued the bequest, that document no longer exists. Scholars have been able to track a number of Wythe's books by looking for markers signifying his ownership, such as his signature, his bookplate, or manuscript notes. More than 50 such books have been located, and they exist in libraries including the Library of Congress, the Library of Virginia, and libraries at the University of Virginia and the College of William & Mary. Fifty books is a great start, but the folks at William & Mary wanted to dig deeper. This is where the forensics work came in. They were able to track down four previous attempts to catalog Wythe's library, ranging from 54 to 466 titles. Combining these bibliographies and their various sources, the team amassed a wish-list of sorts of nearly 500 titles. But they don't simply want to know the contents of Wythe's library; they want to recreate it by actually purchasing as many of these books as they can track down. So far, they have collected 174 titles, and they are constantly adding more. If all goes as planned, they will eventually construct a separate display room with a permanent exhibit devoted to Wythe, his career, and his library. To learn more about this project, check out "Forensic Bibliography: Reconstructing the Library of George Wythe," in the Winter 2013 issue of the Law Library Journal. Or, if you happen to find yourself in Williamsburg, stop in the Wolf Law Library and check out the rare book room, where the Wythe Collection is on display. And if you can't make it to Williamsburg, we have a little slice of history right here at Gallagher. John T. Condon, the first dean of UW Law School, donated his collection to start the law library. While many of these titles have been integrated into the library, some of his books are on display in a case on the first floor of the library. Come on by and check them out! Nov. 19 is World Toilet Day (#worldtoiletday), calling attention to a huge global problem. To spread the message, Water Aid recruited Louie the Loo, who sings and answers interview questions. A third of the world's population lacks sanitary and safe toilet facilities. (Worldwide, more people have cell phones than access to toilets!) The situation is worst in South Asia and Sub-Saharan Africa. The effects include illness, lost productivity, and death (diarrhea is a leading cause of child mortality). Women and girls are particularly vulnerable. For more information, see the World Toilet Organization website. "Oh no, me gotta go!" 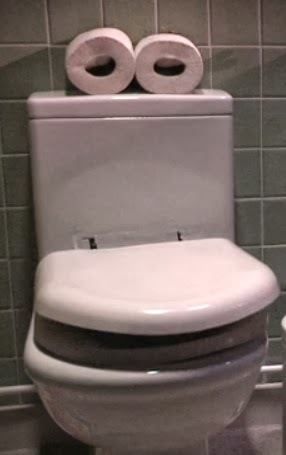 Graphics: Screen snip from Louie the Loo video. Logo from http://worldtoiletday.org. What Qualifies as a Hostile Work Environment When You're a Football Player? To say that football is a contact sport is an understatement. For some, it is difficult to watch a game without cringing or covering one's eyes; aggression, violence and hostility are practically the name of the game. When tough offensive tackle Jonathan Martin was treated for emotional distress and the Miami Dolphins were charged for creating a hostile work environment, football fans were left wondering what was sort of harassment and hostility was taking place off the field rather than on the field. or read the formal definition of harassment in Professor Eugene Volokh's, What Speech Does "Hostile Work Environment" Harassment Law Restrict?. The University of Washington observes Veterans Day on Monday, November 11. Regular hours will resume on Tuesday, Nov. 12.